Messenger to be Discontinued on March 15! 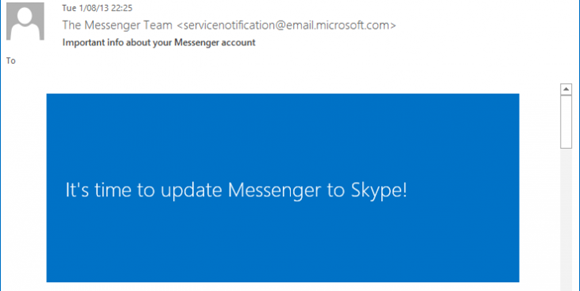 Time to Update Messenger to Skype! Windows Live Messenger will be discontinued from March 15, 2013. According to the email titled “Important info about your Messenger account” that Microsoft has been sending to Messenger users, the popular Instant Messaging tool will not work after March 15th this year. So, all users will have to switch over to Skype that Microsoft purchased last year. Microsoft Messenger is currently available for Windows as well as for Mac OS X and it also has iOS app that lets you communicate to your Messenger contacts on the go. After updating, you can use Skype for Windows, Mac. Skype mobile app is available for iOS, Android as well as for Windows Phone OS. So, the transition will be smooth just the platform will change. It may take a while for new users to become accustomed to Skype UI but it’s pretty simple and easy to use. If you want to update now, download latest version of Skype and sign in using your Microsoft ID.